Disney’s new remake of THE LION KING is not live-action. The movie is entirely created inside a computer, based on actor performances captured in a Los Angeles warehouse. You would never know that by looking at the footage, however. THE LION KING looks absolutely amazing! The film, directed by Jon Favreau, is astonishingly lifelike, with photorealistic savanna environments and animals that look like they could step right off the screen — even when they’re talking and, yes, singing. Check it out below. Let’s start at the end. 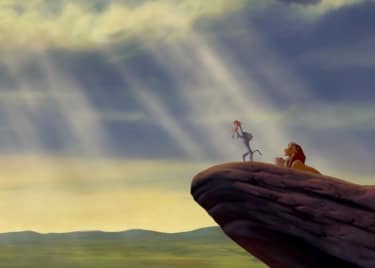 One of the biggest questions about THE LION KING has been how it would handle the story’s singing animals. We’ve known that songs would be part of the story, but will we see Timon and Pumbaa teaching Simba how to belt out “Hakuna Matata”? 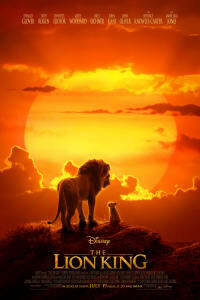 This trailer ends with Timon (Billy Eichner) and Pumbaa (Seth Rogen) strolling happily along, singing part of “The Lion Sleeps Tonight.” We haven’t heard this film’s version of their most famous song, but you can bet we’ll get there soon — especially since this new trailer features a sequence that fans will remember from the end of that number as it appeared in the original movie. You’ve got to talk before you can sing. For anyone who has wondered how super-realistic characters of THE LION KING would look as they speak lines of dialogue, this trailer has your answer: perfect. 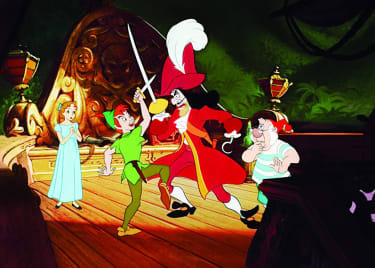 There’s just enough mouth movement to show us who is speaking, but not so much that it looks weird on the faces of these otherwise lifelike animated characters. This trailer only gives hint of this remake’s version of Zazu, voiced by John Oliver, seen above with young Simba. But at CinemaCon 2019, Disney showed off an extended version of their encounter, and even a character like Zazu looks great while speaking. Disney and director Jon Favreau have done more than recapture the magic they conjured in THE JUNGLE BOOK — they’ve surpassed it. In the original movie, scenes with Scar and his hyena enforcers were ominous and, for young audiences, even frightening. What we see in this trailer proves that Disney isn’t trying to ease up on that tone for the remake. If anything, Scar (voiced by Chiwetel Ejiofor) and his henchmen are even more scary this time out, thanks to the film’s overall sense of realism. The one thing we haven’t heard yet is the voice of Donald Glover as adult Simba. Some footage, such as the CinemaCon presentation, has revealed JD McCrary’s performance as the young Simba. Disney clearly knows we can’t wait to hear Glover’s performance, and is holding back for now. With the brilliant level of quality seen in all other aspects of this movie, we don’t expect to be disappointed. Learn a problem-free philosophy when THE LION KING opens on July 19!